Research says that you cannot just ‘get’ bed bugs. They must be bought in your home. 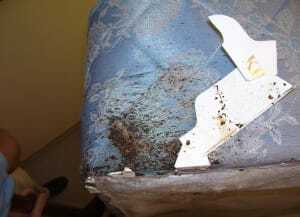 So what are the common signs of a bed bug infestation? The most common sign of a bed bug infestation is when a person goes to bed feeling fine and wakes up in the morning or in the middle of the night with itching and unexplained bites. Although bites can suggest bed bug infestation, they are not a good source for finding bed bugs. This is so because the reactions of bites differ from person to person. For example, a person may be bitten while travelling far away from home but may not notice it until he reaches home. These bites do not mean that the home is infested. Alternatively, a person may not be affected by bed bug bites at all. This may mean that the home is already infected by bed bugs but remains unnoticed. These bed bugs will get noticed when their population increases so much so that they can be easily seen. Another small but important factor to identify bed bug infestation is to know what these bugs look like. The adult bed bugs can be easily seen with the naked eye. They are reddish brown in colour, without wings. Their size is around an apple seed. Even Immature bugs can be seen with the naked eye. They are small in size and translucent yellow-whitish in colour.